When you've chosen the perfect bathroom vanity, sink or toilet, you may think that your design project is finished, but there are many other items that you can incorporate into your washroom. Bathroom accessories come in all shapes and sizes, so you can set about improving the utility, storage space and aesthetics of your bathroom once the bigger stuff is out of the way. 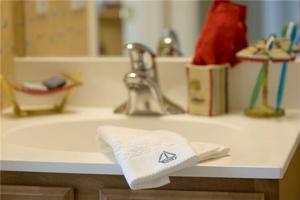 Unifying the look of your bathroom should be your primary concern. For instance, if you have small bits of chrome on your toilet or shower door handles, it's best to incorporate small items that can make the space look a bit more uniform. Everything from toilet paper holders, soap dishes and soap dispensers can be low-cost improvements that can give your space a modern touch. Décor is another thing to consider, and it can really bring a warm touch to your bathroom. Consider installing a few floating wall shelves - these items are a great space-saver, and they can hold everything from picture frames to souvenirs and other accents. Pay attention to the little things to put your own personal stamp on your design project!